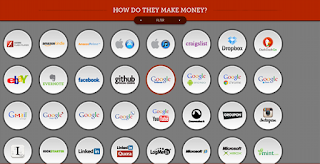 There are so many products or services that are based on the above business models and the one of the best site that I have come across is http://rcs.seerinteractive.com. Its a fantastic site that can provide this info in one of the best way possible. A lot of interesting facts can be then further discover once we start looking into the URL provided right at the bottom of the small hover pop-ups that tells about the business model our favorite site do! For e.g. 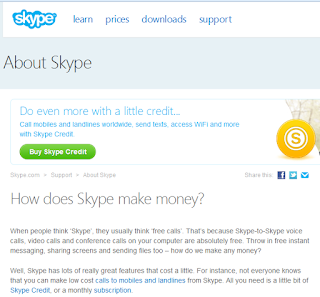 on checking how does Skype makes money i found this interesting section on Skype site @ https://support.skype.com/en/faq/FA335/how-does-skype-make-money that tells us how is Skype doing its business. We might be visiting the site, but would bother to check this info most of the time! 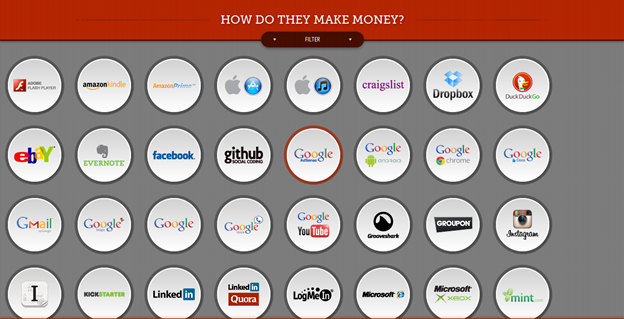 And evernote is for sure a profitable Co. and one of the most loved app on all devices! Try to dig the info. for all the Co. listed in the site at http://rcs.seerinteractive.com and enjoy wanted or unwanted information!